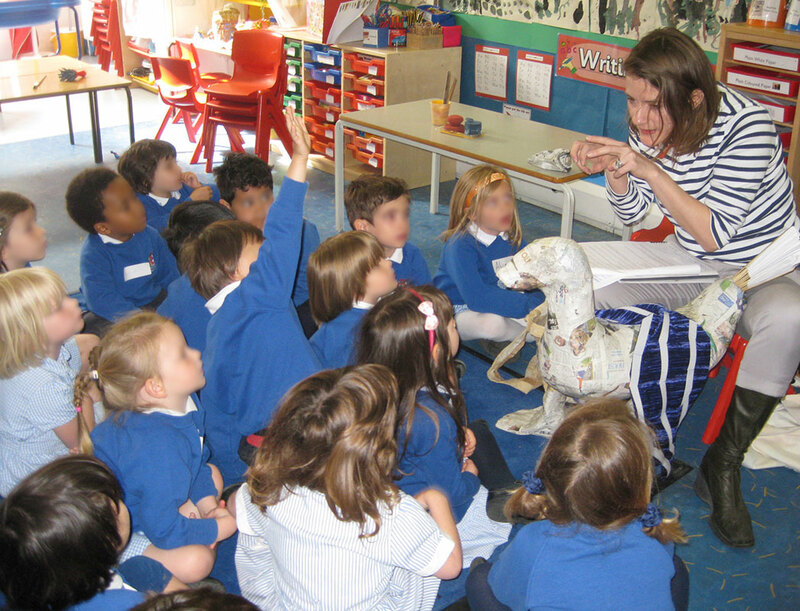 I’ve worked on primary school projects before but never have I been asked to work with pre-school children. 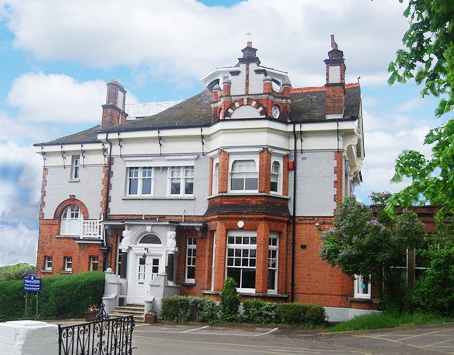 My latest school project was at DUCKs, the kindergarten and infants school for Dulwich College. The school’s fundraising had given me a budget with which I was asked to devise a set of art workshops for all the children and then create some kind of final piece for the foyer. The children range from 3 years old up to 7 so I was a little tentative about how to incorporate glass into this school project. In the end I decided that as children of all ages respond to storytelling I would base the art workshops around the building of props to illustrate and bring to life a story. 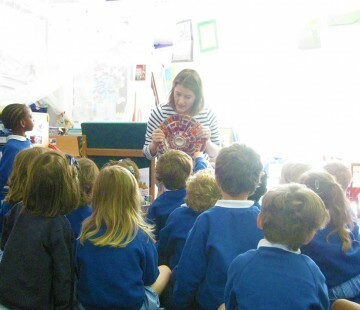 I toyed with the idea of getting the children to help me write the story but in the end, because of time constraints and the very tight schedule of work that I had to fit in to the last two weeks of term, I realised I would have to come with a ready made story. With an obvious theme dictated by the acronymic name of the school, I wrote a special story about Dappy the Duck. 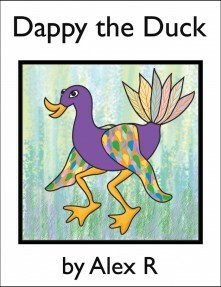 I had some misgivings about using the name ‘Dappy’ because of the idiot pop star who goes by the same moniker, but I liked the fact that the name conflated the words “Duck”and “Happy”, but with a little sense of silliness about it too, which reflected my title character. I consulted a few teachers about my worries, but luckily the demographic of my audience was either too young or too old to have heard of the NDubs fool, so I was in the clear! The story sends Dappy the Duck on a journey to follow a trail of clues left by his grandmother to find his inheritance, a treasure chest full of glassy gems. On the way he meets a kitten, a squirrel and a toad, and he learns three life lessons which reveal him to be kind, helpful and happy to his new friends. 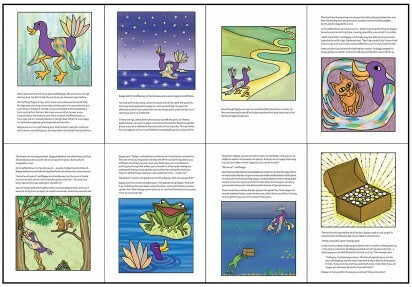 I devised eight art workshops to match each class to one chapter of the book. 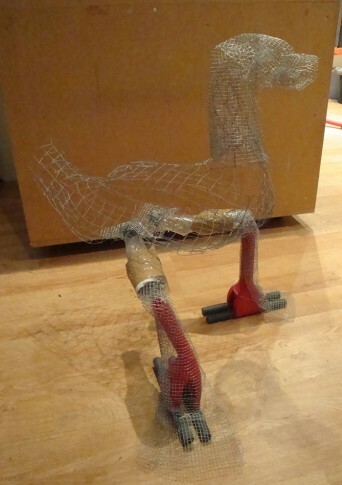 Some of the art activities centred around decorating a model of Dappy the Duck, and an added complication was that it had to be detachable so that the various body parts could be separated for different groups of children to paint. 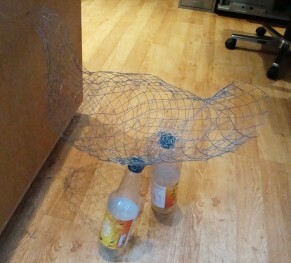 I spent an evening making the basic model out of chickenwire with screw in legs made from a couple of bottles and feet made from parts from two old mops. 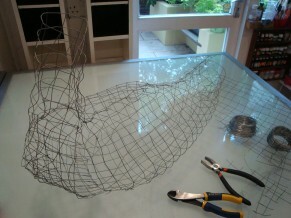 It was all rather Blue Peter, but once it was covered in papier mache it began to take shape! The papier mache Dappy accompanied me to every workshop and, even in his unfinished state, he was a useful prop for telling the story! 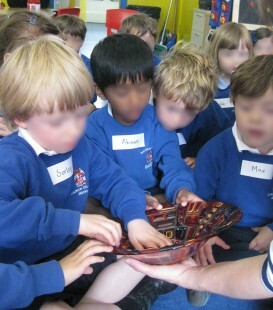 Each session lasted an hour, with my initial introduction showing the children one of my bowls and talking about the special qualities of glass. All the children loved touching the bowl, but it was really satisfying to me that the eldest children were also really interested in the technical aspects of kiln formed glass and asked some really incisive questions. 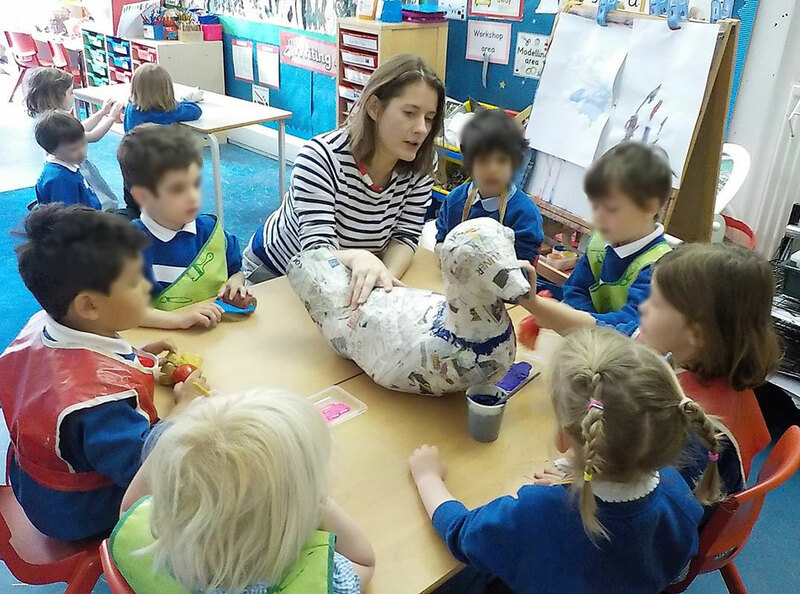 Then, after hearing the story, the children participated in a half hour artmaking session which related to one of the eight chapters of the story. Dappy developed from session to session. 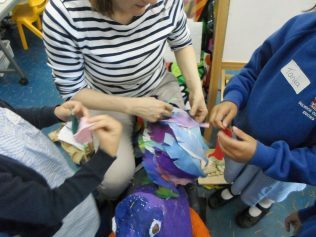 The youngest children helped to paint the model duck, and made feathers for the wings and tail and one workshop was based around making him a nest. 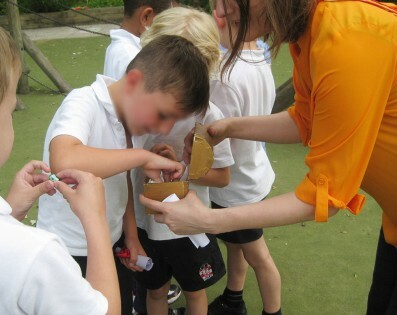 With the older children I could explore the themes of the story in a more nuanced way, so the last two workshop sessions related to thinking about the qualities of a good friend, and how to be kind, helpful and happy. 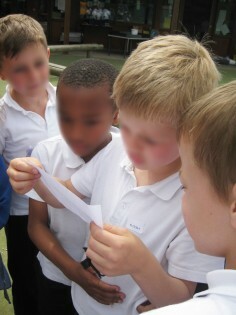 No matter the age of the children, I discovered that one of their favourite bits of the story was hearing the clues that Grandma had left for Dappy, so it was just as well that one of my last minute ideas was to have a child untie a ribbon on a paper scroll and (the older children) read the clue to everyone. Remembering back to my son’s early birthday parties I knew that a treasure hunt would go down well, and it would allow me to tie in the experience back to the glass theme, so the last part of each session was for the children to participate in a three-clue treasure hunt themselves around the playground. 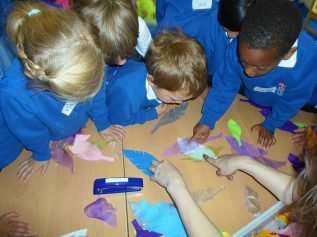 Each group found a box of “treasure” which was actually lots of kiln formed glass pieces. It was sometimes difficult to keep their excitement under control at their being allowed to pick a piece of treasure to keep and take it home! It was with some horror when I heard later from a parent that one of the children had loved his treasure so much he wouldn’t let it out of his sight… the inevitable conclusion being that it ended up being swallowed!! I thought I had made the glass pieces more than large enough to avoid this occurrence, but apparently not too big for this committed treasure-hunter! Luckily the parent involved was very cool about it and only felt awkward about having to describe to her child what would happen to the glass post-ingestion! To see the final glass panels I made for this project click here. I loved all the news, but particularly the ‘Dappy the Duck’ story. Well done!